I'm studying amino acids content in vegetable food. 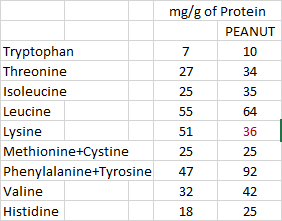 I was looking at peanut protein and noticed its similarity with chicken meat, as you can see in the table below (quantities are measured in grams). Third column is first column minus second column. Green amino acids are the essential ones. The biggest difference (-1.11) is Lysine, but it is still bigger than the lowest (0.2445). So is, in this case, Tryptophan the limiting factor in protein synthesis? (Tryptophan amount is < than any other amount). 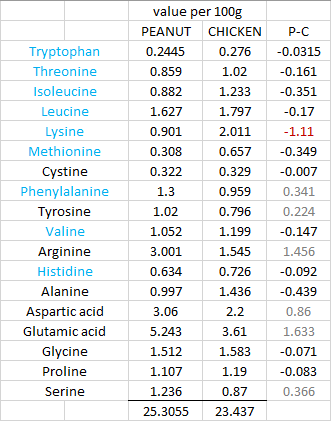 The table below lists the optimal profile of the essential amino acids (first column). Second column is obtained by dividing the values in table 1, first column, by 25.3055 and multiplying by 1000. Notice that Lysine is the only one amino acid less than the reference (36<51). 1) Have peanut proteins a limiting factor (if yes what is and why?) or can be considered a complete protein? 2) If the answer to 1) is "yes it has a limiting factor" what vegetable foods rich in lysine can be eaten with peanut in order to obtain all the amino acids? And how to calculate the ratio of peanut and the complementary foods to eat in order to get the proper profile of the essential amino acids? I'm not sure if biology is the correct site to post this question, so if you know a better one let me know, thanks. You're not using protein as it is to maintain your body. It's first broken down to the individual amino acids, which your body can then use to build new stuff. If you're lacking one of the essential amino acids, you can only build as much new protein until that runs out, and all the other amino acids are just excess. A protein that contains all the necessary amino acids is called a complete protein, and you could calculate the differences in the so-called quality of the protein. A perfect protein (i.e. from egg/milk/soy) will contain amino acids in exactly the ratio you need, some protein contains so little of a certain amino acid that you'd need to eat twice as much of that protein (for example rice or peanuts). In your case, if beef is making you recover fastest, you'd need to eat 30*0.92/0.70 = 39g of peas for the same effect. You could get around this by combining different sources of protein. For example grains are limited in lysine, while beans are limited in cysteine/methionine. Firstly, here are many types of proteins in both peanuts and chicken, so it is a little ambiguous to say "peanut proteins" or "chicken proteins". Secondly, proteins are proteins. "Complete" and "incomplete" are simply nonsensical terms for describing these macromolecules. Each protein performs a certain task, be it structural, like keratin, or functional, like enzymes. The purposes, as well as the abundances and characteristics of the proteins in say, a piece of chicken define its traits. The amino acid content, though related to these things about proteins, do not imply them. Proteins in different food items are simply made up differently. To answer the question, no, there is no inert limiting factor on the synthesis of proteins in peanuts, and yes, these proteins are "complete". Not the answer you're looking for? Browse other questions tagged proteins food amino-acids or ask your own question. Are human beings evolved to eat meat?